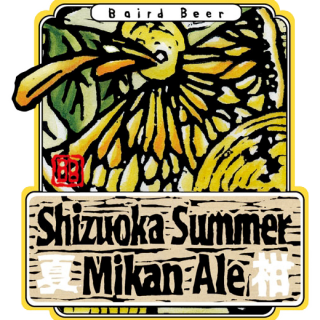 An explosion of refreshing, zesty & tart fruit character is delivered courtesy of in-season local natsumikan fruit, citrusy hops, and wheat (raw & malted). The artwork here is Eiko-san’s (our designer/artist/friend) beautifully vibrant and colorful rendition of the juicy/pulpy insides of a sliced summer mikan (natsumikan) fruit. With just a glance you can almost feel and taste the fruit’s piquantly refreshing character. The kanji on the label are the characters for summer (夏) and citrus (柑). A summer mikan (natsumikan) is a grapefruit-like citrus fruit that is tart and sweetly sour in flavor and wonderfully aromatic. The only fruit to make it through the doors of the Baird Brewery, of course, is fresh whole fruit recently plucked from the land. The natsumikan fruit we use is home-grown here in Shizuoka prefecture. The bounty of fruit is painstakingly hand-processed by the Baird Brewery team before its introduction into the brew-house and then again into the cellar. You can taste the freshness and wholesomeness of the natsumikan fruit in each sip of this extraordinarily piquant brew.